There's a treadmill workout plan for every level of fitness and every fitness goal. Treadmill workouts are performed indoors, so you don't need to worry about air quality, excess heat, cold temperatures, rain or icy conditions. The more sophisticated treadmills come with heart rate monitors, to help you stay in your training zone. Some even have calorie calculators. The American College of Sports Medicine, also known as ACSM, updated their exercise guidelines in 2005. They now suggest that people perform a minimum of 30 minutes of aerobic exercise on most days of the week. If you are susceptible to muscular-skeletal injuries, consider alternating walking and running treadmill workout plans. Setting the treadmill on an incline so that you can walk uphill will increase the intensity while minimizing the impact on the muscles, bones and joints. You can avoid injury by planning a progressive workout. Dedicate the first week of treadmill training to establishing an aerobic base. If you are not used to aerobic activity, begin with three 30-minute workouts per week. If you've been performing other types of aerobic activity, start with four weekly 30 to 60-minute treadmill workouts. Set the pace at three to four miles an hour. Once you've established your aerobic base, you can progress your program with interval training. Walk for four and a half minutes at three miles per hour, then jog for 30 seconds at four miles per hour. Repeat the sequence six times to create a 30-minute workout. Begin this program during the second week of treadmill training. If the program feels comfortable, you can increase the intensity during week three. Reduce the walking segment to four minutes at four miles per hour, and then jog for one minute at five miles per hour. Consider adding an extra training day. In the weeks that follow, gradually reduce the walking segment and increase the jogging segment. 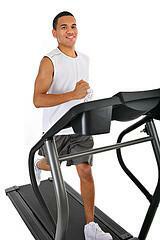 Some treadmill workout plans can tone the leg muscles while providing aerobic exercises. Set the machine at an incline, and stand facing sideways. Begin at a slow pace. Step up with your top leg and then bring your bottom leg up to meet it. Continue for three minutes, and then change sides. You can intersperse forward jogging, walking or running segments to create a complete workout. Circuit training involves interspersing aerobic exercise with muscle toning segments. This type of program usually involves separate stations, but you can simplify the workout by using an inclined treadmill and a resistance tube with an attachment device. Attach the tubing to bar under the treadmill console. Make sure that the ends of the tubing are not on the treadmill skirt. Set the machine at an incline, and begin by walking or jogging for five minutes. Pause the machine and walk toward the downhill end. Grab each of the tube handles with your hands. Simultaneously perform a squat and a row. Bend your knees, so that your hips move toward your heels, and bend your elbows so that they move behind your body. Squeeze your shoulder blades together as if you were catching a pencil between them. Perform 12 repetitions, and then restart the machine and jog or walk for another five minutes. Then, pause the treadmill and turn around so that your back is facing the console. Place your left foot at the high end of the treadmill and your right foot at the low end. Your right foot will be flat, and your left heel will be lifted. Grab the tube handles. Bend your elbows and line your knuckles up with the center of your chest. Simultaneously perform a lunge and a chest press. Bend both knees, keeping your spine in an upright alignment. Extend your elbows directly ahead of you. Perform eight repetitions on each side. You can intersperse other exercise such as sideways walking, biceps curls and triceps extensions. Add an element of balance training to the workout by walking backwards on the treadmill. Just be sure to set the machine to a slower pace.